This remarkable new event sees the start of a whole new approach to the spirituality of yoga. This course will open the adventure of spirituality like an exciting new book for you. Outwardly, you'll be exploring spirituality, yoga, and meditation on walks within Snowdonia's glorious mountains. Inwardly, this course will help you open new chapters within: unfolding your intrinsic purpose, building connectedness with the natural forces of consciousness, and developing incredible relationships with the people around you. Dru UK received a certificate of excellence this year from Tripadvisor for their accommodation. Snowdonia has received a certificate of excellence from Tripadvisor for the accommodation. Snowdonia Mountain Lodge has 21 bedrooms, with a selection of double, twin bedded, and family rooms. With its spectacular panoramic views, situated in the beautiful Nant Ffrancon valley in Snowdonia National Park, it’s the perfect place to relax and rejuvenate. Dru UK's teacher training courses are renowned for exploring the depths of how yoga and meditation techniques really work, exposing the laws of consciousness that have been tried and tested by yoga science across millennia. Now Dru UK offers the opportunity to use these laws to radically enhance your life with the potential to take your life further than you'd ever believed could be possible. This course is primarily designed for graduates or senior students of Dru training courses to accelerate you in your discovery of that extra dimension of yoga practice that makes Dru so extraordinary. However, if you have an established spiritual practice and are (preferably) familiar with core Dru yoga and meditation practices then please get in touch by sending an inquiry to explore if the course would be suitable for you. If you are a beginner with Dru yoga it would help if you have already explored spirituality! If you have no prior yoga or meditation experience, please send an inquiry to discuss whether your experience will make this course possible for you. Snowdonia Mountain Lodge is situated on the A5, eight miles south of Bangor and 2 miles south of Bethesda in the Nant Ffrancon Valley, North Wales. Towering mountains rise on either side, and from your bedroom window, you can see the changing light dancing over the fields, and listen to the sheep and lambs in the surrounding fields. The peace monument's water feature is a relaxing place to sit and soak up the sunshine, or you can meditate by a mountain stream. Dru UK's catering gets rave reviews from the course participants. It’s delicious vegetarian cuisine, tasty and healthy, and complements the courses perfectly. Dru UK also caters for vegan and other special diets, such as gluten-free and others. Please don't hesitate to let Dru UK know about your dietary restrictions by sending an inquiry. From Ayurvedic Abhyanga full body massage to foot reflexology, when you enjoy a therapy on one of Dru UK's retreats, that’s when you really feel the true benefits of the whole Dru experience. You can also book a personal mentoring with one of the expert tutors on topics such as chakra analysis, vedic astrology, and much more. Dru UK has an excellent yoga shop in the reception area, packed with healthy snacks, health products, gifts, books, yoga, and meditation accessories. The reception area also provides the perfect environment to browse, relax, enjoy refreshments, and socialize. The rest of the payment should be paid 28 days before arrival. 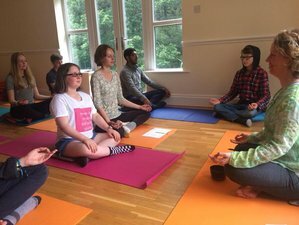 Dru is an international school of yoga, meditation, Ayurveda, and health with training centers located throughout the UK, the Netherlands, and Australia.